Friends, I feel so happy and strong. My life is blessed in ways too numerous to count. I say this, not to brag, but to be clear that this is where I stand: in peace and gratitude. It is true, though, that life can be hard, full of challenges that we aren’t certain we have the strength or inner resources to weather. Illness, poverty, loneliness (among other things) may show up in our lives in big ways or small, and they also show up in the lives of those all around us. Sometimes we know what challenges another faces, sometimes we are unaware until we visit a friend and find her crying, or a note goes up on the bulletin board at the gym about a member’s family in need of our generosity. Sometimes, I am closed to the suffering of others. Caught up in the details of my own life, focused on my own hurts or struggles. It happens to most of us. Other times, I am open and feel overwhelmed by concern and a desire to help. Often, it feels like there is so little of substance I can do. A few years ago, I participated in a book discussion group at work, sponsored by our Campus Ministry department. I can’t remember the name of the book, but the theme was mercy. The author(s) used a working definition of mercy that went something like this: “to enter fully into the chaos of another’s life”. I clearly remember saying, in the ensuing discussion, that I didn’t know whether I wanted to do that – entering fully into someone else’s chaos sounds not the least appealing, especially if you have your own chaos. We are all so good at allowing ourselves to intellectually grasp what another person might be going through. We donate canned goods, drop money in the red bucket, participate on boards and go to fundraisers. These are all good things to do, but we can so often do them without actually engaging with someone in pain. Entering into someone else’s chaos demands the engagement of our hearts, not just our minds. That is so much more difficult, and it can really be scary. A while ago, I participated in a one-day service project to deliver Meals On Wheels. My experience was different from that of the others who participated that day – it just so happened that my route included some particularly grim experiences. I haven’t been able to go back, though I was happy to donate the proceeds of my hunger challenge that year to that program. So maybe that was too much chaos, way too fast. But when the people that I know and interact with daily are suffering, entering into their chaos means, first, walking beside them so they know I am there. I’m pretty sure I can do that. Last summer, Lori Erickson, the “Holy Rover” at Spiritual Travels, put out a call to her women readers: if you would be willing to be interviewed for a magazine article she was writing on prayer, please contact her via email. Lori’s blog is the first one I ever subscribed to and, though we have never met, I felt inclined to respond in the way one would if a friend asked for your help. We arranged a time to speak via telephone, and she called me one sunny morning during my summer vacation. What I had neglected to think about was the fact that she would ask me questions about my own prayer practices. I am not a very good pray-er: I don’t pray regularly; I feel self-conscious when I do so (Dear God, I begin, as if writing a letter to my Higher Power); I run out of things to say as soon as the pleasantries have been exchanged. As a teenager I used to pray the rosary specifically for its soporific effects when I couldn’t fall asleep – it was a particularly bad night if I was still awake after 10 “Hail Mary’s” and a “Glory Be”. In the ensuing conversation with Lori, therefore, I had little to offer. I managed to make the comment that I think some women have a tough time asking for things in prayer because they feel selfish doing so, and they’re keenly aware the Lord has bigger fish to fry. The answer was unequivocally, “No.” When prayer is answered in what seems to be an undeniable manner – a direct message, a healing, an indisputable sign – it is easy to believe in its efficacy. And most of us pay attention to that (at first, at least). For me, that verbal message was a beacon of hope. Yes, things WILL change, get ready. It was still up to me to figure out what changes to make in my own life in order to be ready. Which leads me to the other side of the prayer conundrum. When the answer isn’t so easy to distinguish, or when we truly feel like no answer is forthcoming, it is much more difficult to believe in prayer’s effectiveness. Much more difficult to believe someone is listening, that we are doing more than talking to ourselves inside our own heads. Lori’s article appeared in the December edition of Women’s Day magazine. I received an email from her, regrettfully informing me that the editor had cut the article’s length, choosing to completely remove the part about me. In all honesty, I was relieved. I had started to feel like an imposter – although Lori’s request was for ordinary women to share about their experiences, I felt uncomfortable putting my two-cents in on a topic about which I have been so ambivalent. 1. Thank goodness my comments on prayer were edited out of the magazine article. 2. If there is even a chance that my doing so can lift others, help them be more resilient in the face of life’s difficulties, make them feel loved, I need to get past the discomfort I have felt, and practice praying. I will likely never speak with an expert’s authority on the subject of prayer. There are many people, including my sister, who can with genuine knowledge and personal experience wax eloquent on the subject and say things truly worth hearing. However, I am coming to believe that while prayer may be a private conversation between my heart and God, the practice of prayer is not only about me. From now on, when I tell someone that my thoughts and prayers are with them, I will make a more sincere effort. In their lowest moments, I want the people I care about to feel me lifting them up. You may think I would be disappointed with today’s weigh in. I’m not. The scale may not show it, but my hard work is showing – I had to buy new pants again because the pair I bought recently were already too big. I bought a lovely pair of size 16 slacks last night. When I graduated from college, I wore a size 12. Five years later, size 20. I breezed past 16 somewhere in there, early-to-mid 80’s. So, today, I’m feeling pretty darn good! The Three Wise Monkeys (Japanese: 三猿, san’en or sanzaru, or 三匹の猿, sanbiki no saru, literally “three monkeys”), sometimes called the Three Mystic Apes, are a pictorial maxim. 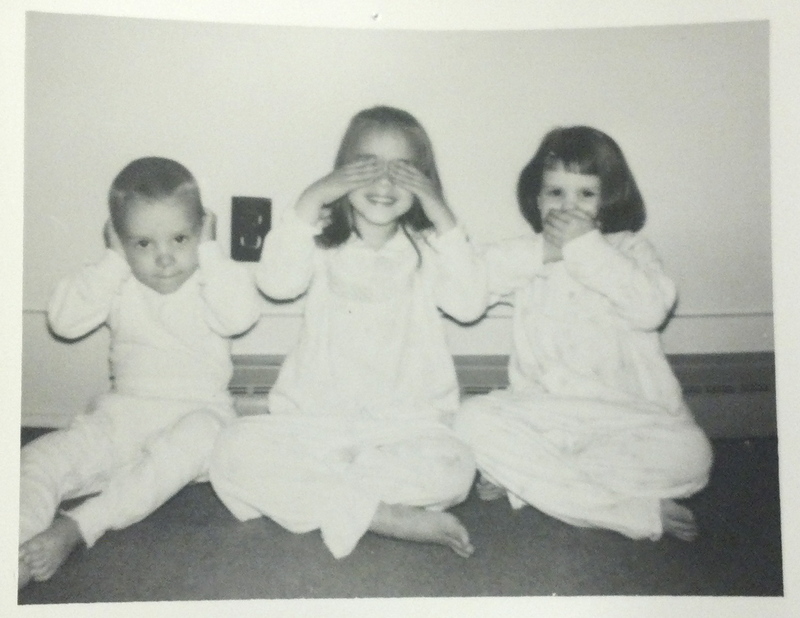 Together they embody the proverbial principle to “see no evil, hear no evil, speak no evil”. The three monkeys are Mizaru, covering his eyes, who sees no evil; Kikazaru, covering his ears, who hears no evil; and Iwazaru, covering his mouth, who speaks no evil. Sometimes there is a fourth monkey depicted with the three others; the last one, Shizaru, symbolizes the principle of “do no evil”. He may be shown crossing his arms. There are various meanings ascribed to the monkeys and the proverb including associations with being of good mind, speech and action. In a departure from everything I’ve ever done on this blog, I am bowing to pressure from my friend, Layne, to write a post about her. (I made the mistake of expressing to her that I wasn’t sure what I would write about this week.) She has given me no instructions or parameters, no topics to include or avoid. Normally, I would be concerned about alienating my other friends, but many of you know Layne and will, therefore, be kind about my decision to cave. Those who don’t know her, really should meet her! Layne, in the center, on hot toddy night last winter. Layne came for an interview three years ago in December, shortly after my entire staff resigned within a couple weeks of one another. I was stressed. Ok, slightly panicked. My most significant impression of her during the interview can be summed up in one word: genuine. She didn’t have that “I’m on an interview” false persona. She was friendly without being overbearing, thoughtful but enthusiastic. I didn’t know if she was ready for the job, but I was desperate. She’s an avatar (definition: a physical representation of an abstract concept). A few years ago, there was a big splash made about “indigo children”. In describing the concept, one site states, “Descriptions of indigo children include the belief that they are empathetic, curious, strong-willed, independent, and often perceived by friends and family as being strange; possess a clear sense of self-definition and purpose”. This description may or may not accurately describe a group of “special children”, but it is a perfect description of Layne. She had a tough time in school and has often been perceived as strange, its true. I maintain that this is due, in large part, to the fact that her perceptual abilities (intuition, empathy, emotional capacity to take in stimuli from the world around her) are more keen than those of her peers. She’s not an old soul, she’s a new soul with mad skills. She can make anything out of paper. She can interpret the language of dogs. She wants to, and eventually will, start a social revolution on twitter (she’s just waiting for the right cause to present itself). She can send 84 texts in rapid succession – when she does this, the notification chimes on my phone sound like a slot machine ringing a jackpot. Winning! Layne can meet with roommates who say they hate each other, and before they leave her office they are professing their undying friendship. She can spend three minutes with me and accurately put her finger on whatever is troubling me, even when I am not talking about it. When I do talk about it, she can finish my sentence for me and always picks the exact word I was going to use. It can be uncanny, and would be frightening if it weren’t for the fact that Layne is inherently trustworthy. Remember that description of indigo kids? It says they have a clear sense of self-definition and purpose. Layne has told me her life’s purpose, and it is, believe me, uniquely hers! Lest you get the impression that I see her as something other than human, allow me to explain one last thing about Layne. She is young and open to experience, she rushes into things she should take her time with, and she drags her feet when she should be running. In other words, she has room for growth. That may be one of the reasons I am enchanted by her extraordinary nature: there isn’t only room for improvement, she expresses an active daily desire for it. She is committed to growing into her best possible self, and she can feel a future ahead in which that is exactly what happens. So can I. If Layne were an animal, she would be a giraffe – her long, graceful neck holding her head above the crowd and seeing far, far into the future. Where another magical creature looks back at her, with her own eyes. Sorry about the poor image quality today! 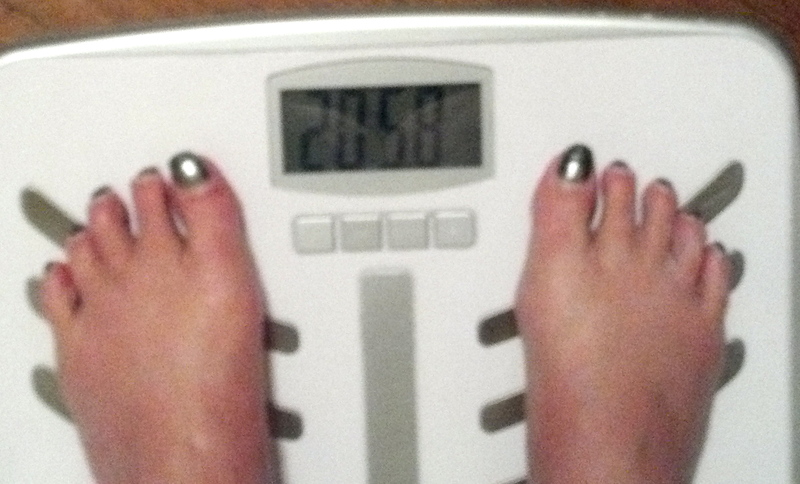 Although I didn’t publish a weigh-in last week, I did (in fact) weigh myself. 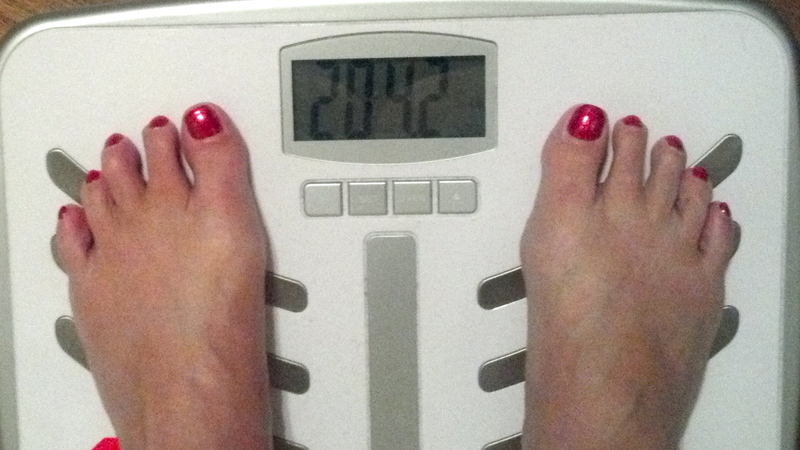 I have been bouncing up and down between 205 and 210 for weeks now, and on Thanksgiving the scale read 210. I didn’t publish it, because I was so disappointed in my uneven effort. Well, I am happy to report that I am back on track this week, and plan to enter one-derland sometime before the new year dawns. Tough stuff heading into the big holiday season, but the goal is within reach and I am ready to reach it!